Valid only at participating locations (excludes Carmel Mountain, National City, Mira Mesa, and Mission Valley). 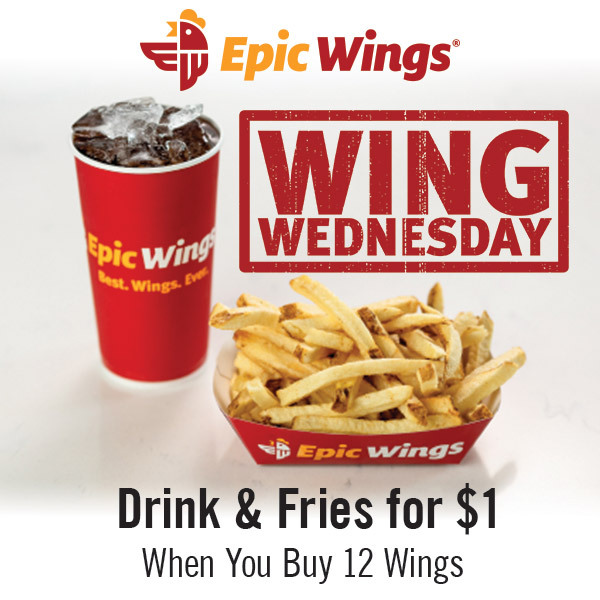 Participating guests will receive a 20 oz fountain drink and small fry for $1 with purchase of 12 bone in wings, or 10 boneless wings, or 8 tenderloin strips. Cannot be redeemed with other offers or promotions. Restrictions apply. Valid only on Wednesdays – 4/3/19 through 5/2/19.